Codementor Support - I&apos;m having troubles with Zoom, any alternatives? All Categories ​>​ I&apos;m a User ​>​ Getting Help ​>​ Start a Session with a Mentor ​>​ I&apos;m having troubles with Zoom, any alternatives? 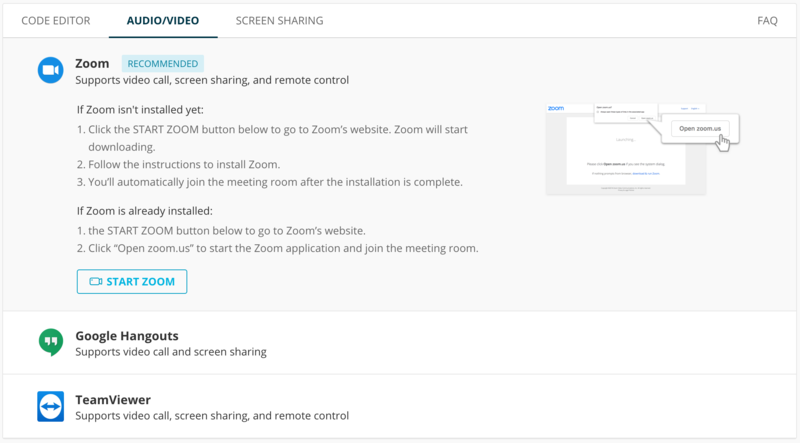 Please make sure you’re using the latest version of Zoom and review their System Requirements to make sure your device can run this tool smoothly. If you’re still having troubles, you can try using Google Hangouts or TeamViewer for your session.